Written by: Rebecca Miller on January 16, 2017. Eugene Cernan, 82, passed away Monday January 16, 2017 a hospital in Houston. Cernan was the last man to walk on the moon in the Apollo 17 lunar mission. The Apollo 17 mission set several records on the flight: longest manned lunar landing flight, longest time in lunar orbit, largest lunar sample return, for Cernan, the unofficial land speed record on the moon in a rover. 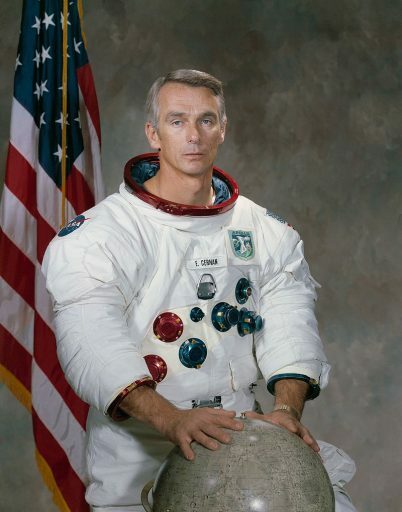 Cernan attended Purdue University, graduating with a Bachelor of Science in Electrical Engineering in 1956. While at Purdue, Cernan entered the Naval Reserve Officers Training Corps leaving university for the U.S. Navy at the rank of Ensign. While in the Navy, he attended Naval Postgraduate School receiving a Master of Science degree in Aeronautical Engineering. Having logged over 5,000 hours of flight time and most of that in a jet, he was selected for the astronaut program on the third round of selection. Cernan’s first space mission was aboard the Gemini 9A module. He also flew in the Apollo 10 module leading up to Apollo 11 actually landing on the moon. 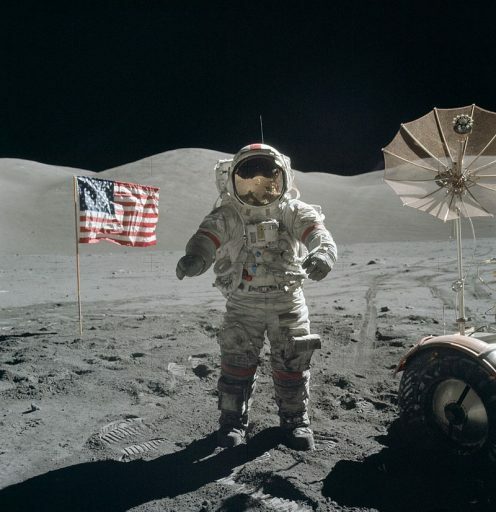 Cernan had been selected for Apollo 16, but held out, waiting for a command role in Apollo 17, the mission he was finally able to land on the moon. Cernan stated, even years later, didn’t care that other men had already walked on the moon, this had been his first time to be there. Cernan on the 3rd EVA of Apollo 17. Our hears go out to Cernan’s family. God Speed, Captain!